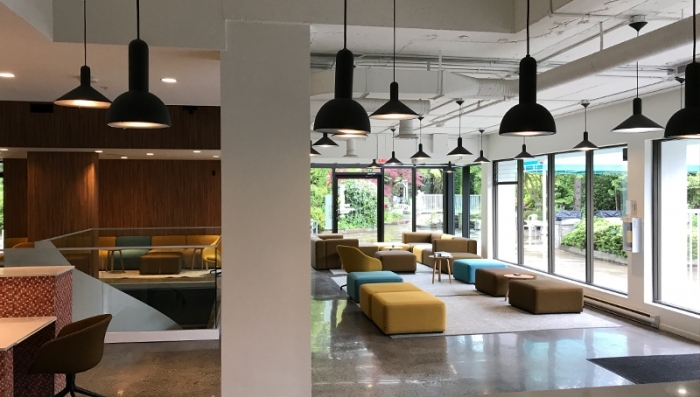 EC Vancouver: Superior APT Co-Living. This modern accommodation option offers you a sense of community and a great opportunity to meet new people and share experiences. With the many shared amenities such as a BBQ, a games room and Mini Golf, you have the unique chance to make friends in a fun and sociable way, as well as master your cooking and mini golf skills. After a cool Canadian winter day, you can warm up in the sauna or relax in the communal lounge and watch TV with friends. In your ensuite unit you will be able to enjoy panoramic views of the surrounding area from your private balcony. Each unit is equipped with a mini kitchenette complete with fridge, stove top, microwave and sink, as well as the necessary kitchen utensils. In addition, you have a desk and chair for study and cable TV to catch up on all the local news and TV shows in Canada. Your unit has a comfortable futon, with linens provided, that can fold up into a cosy couch, in addition to a full sized bathroom and plenty of storage. The west side neighbourhoods of Shaughnessy & Fairview have been a center of Vancouver culture since the city was built. With the shops of Granville Street steps away and the nightlife of downtown just across the bridge, you live in a true urban village. The area around the APT Living residence has a quiet, suburban feel yet just a 10-minute walk will take you to the many bustling shops, cafes and restaurants of the neighbourhood. Broadway street is just a 5-minute walk from the residence and this is where you will find the transportation links that will take you to Downtown Vancouver in 15 minutes, and Beautiful British Columbia’s mountains and trails in 40 minutes. On your last day, please leave the room in the same condition as you found it and leave the keys and laundry card on the desk, you do not need to lock your room. Check outs must be done before 10:00 am, please note that if you leave your room after 10:00 am there will be a $30 late check out fee for each 30 minute you are late. To provide you with more detailed information about Apt Living Amenities, getting to know the area and to meet more EC Students living in the residence, we have planned a meeting this coming Monday at school after your first day orientation. We will be waiting for you in the Accommodation Department located on the second floor of EC Vancouver. We will explain what the residence can offer you and explain how to use the amenities, including the laundry machine (you will need your laundry card attached to your keys in order to use the laundry); and will show you the fastest way to get to school. Please note that attendance is mandatory as you will have to sign the house rules, know the possible fees after check-out and meet the accommodation team. If you have any problems during your check in or check out, or in case of emergency please contact EC Emergency line at 604.773.0488 or dial buzzer number #5555 from the main entrance of the residence. Please do not go to the Front Desk located on the main floor as they do not work for EC. Students leaving their accommodation must give notice in writing 4 weeks prior to termination. After deducting the price of accommodation used, including the required notice period, charged at standard accommodation rates, students will be refunded the remaining accommodation costs. If the 4week notice period is not provided a cancellation fee equal to 4 weeks of the accommodation cost will apply. Please note: Certain accommodation options may be subject to special cancellation charges. Should these differ from above, students will be notified at the time of cancellation. If you booked an airport transfer, someone will meet you at the airport and bring you to your residence. If you are at International arrivals, you will meet an EC Transfer Representative after you walk through 2 sets of automatic doors. They will be wearing a yellow t-shirt and holding a yellow sign with the EC logo on it and standing across from the wooden statues. If you are at Domestic Arrivals, collect your bag from the baggage carousel and wait in that area. You will see an EC Transfer Representative wearing a yellow t-shirt and holding a yellow sign with the EC logo on it. 1.You can only check into your room at 3:00 pm or later, please do not try to get in earlier as there may be another student in your suite or your room may not be ready. 2.When you arrive at the Residence (after 3:00 pm), you will have to dial buzzer number #5555 inorder for us to open the main door and to verify your room number. You must give your fullname and surname tobe let inside the Residence. Please note that we only have 30seconds to talk to you over the buzzer, if you forgot to ask anything, please dial #5555 againandwe will be able to help. 3.Once inside the lobby, please go to the right side and take the elevator to your floor. 4.Once in your floor, you will find the room number on the doors of the suites, please walk alongthe corridor until you find your room. 5.Once there, please open the door, it will be unlocked. You will find an orange key cord with your keys and the laundry card on the desk, please take them as they will be your own keys. A deposit of $300 (credit card required, we cannot accept debit cards) will be requested upon arrival. This sum will be refunded 3-6 business days after checkout if no damages have occurred. If a student does not have their own credit card, a Credit Card Authorisation Form can be completed by the student's parent or guardian. EC reserves the right to charge an extra fee up to $300 upon check-out if there is any damage and/or if house rules have not been respected. The week of arrival, students are provided with their room number and detailed instructions of how to check in. Cleaning is provided for $32 a week. Students need to book this service during the first week of their stay. Otherwise, students can opt to clean their room themselves by purchasing their own cleaning supplies. A broom and dustpan will be available. Check ins are at 3:00 pm. No early check-ins permitted.